Equipment: satellite TV; CD player, radio; internet access Wi-Fi (included); combined heating/air conditioning (in the living room). Feature: Please note: Non-smoking house. Property in a two-family property. Furnishing: pleasant, friendly, tiled floor, laminate floor. Please note: Owner lives on the ground floor. apartment, 4 people, 3 room/s, 2 bedroom/s, 1 bathroom/s, approx. 45 m², 1 floor/s, apartment on floor 1, separate access to the property, via external stairs. Bedroom 1: 1 x double bed. Additional information: fly screen. Bedroom 2: 1 x queen-size bed. Additional information: fly screen. Kitchen: Kitchen/ cooking equipment: 2 electric plates, 2 gas rings, microwave oven, dish-washer, refrigerator, coffee machine, water boiler, toaster. open to the living room. Access/parking: 1 x car park; parking on the road near the house. Estate: (shared use): approx. 400 m², closed plot (wall, entrance gate). Outdoor facilities: (shared use): reserved open space (roofed), brick barbecue. 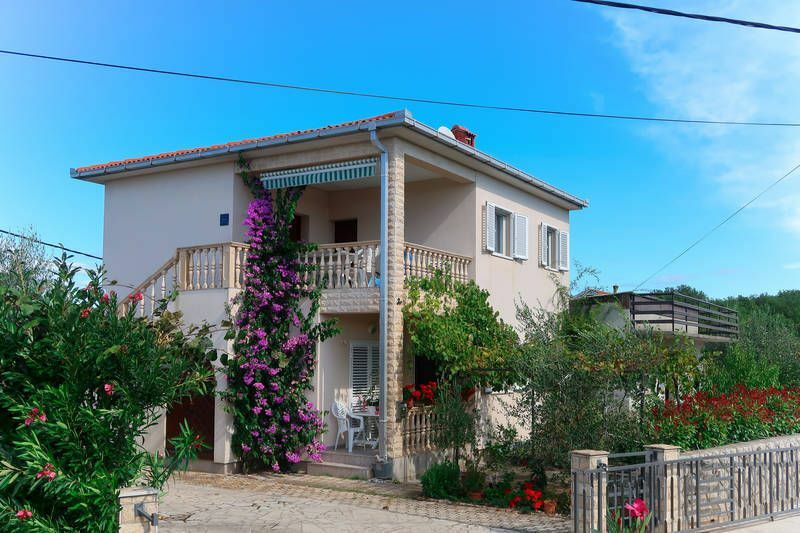 (shared use): 3.0 x 1.8 m, 0.55 m deep, open throughout the entire season, frame swimming pool. Situation: suburbian area, rural, on an island Krk. Plot description: 1 x parking on the estate; parking on the road near the house. terrace 12 m² (roofed, sun-blind), furnishing provided, deck chair, sun lounger. Arrival: Airport Rijeka/Krk in approx. 28 km. Beach/waters: Pebble beach in approx. 3 km. Sea in approx. 3 km. Next village/town: Center Krk in approx. 13 km. Malinska in approx. 15 km. Milohnici in approx. 300 m.
Shopping: Next shopping possibility (Milohnici) in approx. 300 m.